For administration purposes the URC is organised into 13 Synods, each with a Synod Moderator. The whole church meets together in a General Assembly every two years and elects two Moderators to serve the intervening years. One Moderator being and an ordained Minister and the other a Lay person. The United Reformed Church was born on 5th October 1972, with the uniting of the Presbyterian and Congregational churches of England, two of the main strands of reform reaching back to Luther and Calvin. Both churches arose out of the Reform started by Martin Luther, a monk and theology Don at Wittenburg University, when he nailed his Theses ( List of complaints) to the door of Wittenburg Cathedral. 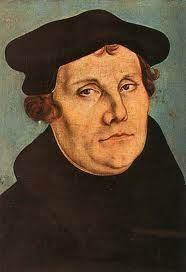 Luther was not concerned about altering the shape of the church as long as the church didn't come between a man and God. 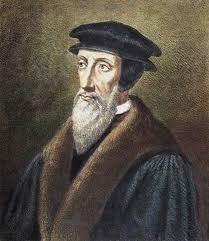 Calvin however believed that the church needed drastic restructuring ( re-forming). He believed that worship should be plain and simple. Every believer should be able to understand the Bible and base their lives on it, and that every one had a calling from God to serve him in their every day life. The Churches of Christ joined the Union in 1981, followed by the Congregational Church of Scotland in April 2000. The URC therefore stands in the Reformed tradition of Christian faith, and believes in one God who is Father, Son and Holy Spirit. The United Reformed Church finds the supreme authority for faith, and conducted by the guidance of the Spirit in the Word of God in the Bible. The Church practices either infant or believers baptism and celebrates the Lord's supper. The URC also recognises the ministry of all Gods people:- All the members serving in the world and through the church, in particular ministers of Word and Sacrament, Elders, Lay Preachers, Church Related Community Workers, and workers from partner churches. NB The above text is not a Quote from either of our two Moderators.